This cabin dates to 1911, and was part of the reconstruction effort after the catastrophic flood of 1903. Oral histories and old farm maps indicate that this cabin was originally used as labor quarters for Chinese farm workers. 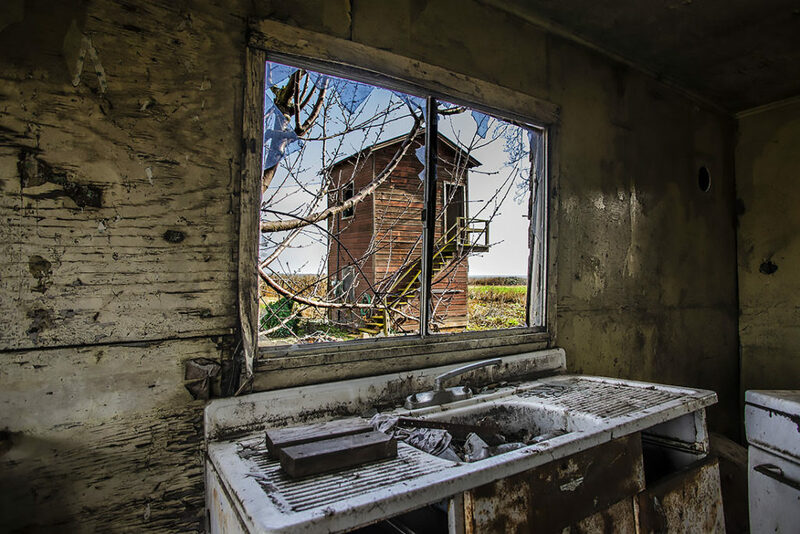 The relentless weather in the Delta and long-term exposure to the elements have taken their tolls on the building. The roof has fallen in and the interior has begun to rot. A solitary wooden column rising out of Sycamore Slough, on the Southern edge of Brack Tract, provides a glimpse into a forgotten world. 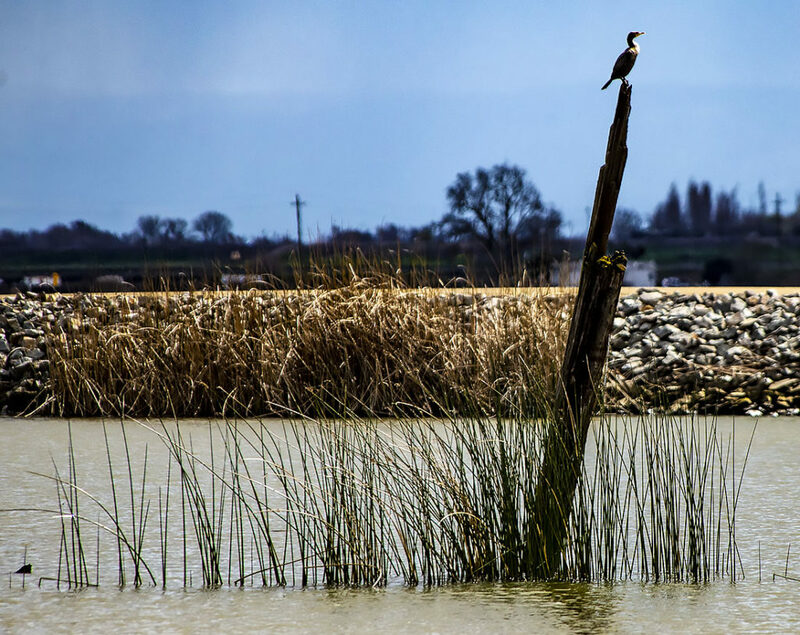 Wooden pilings such as this were used by Chinese farm laborers at the turn of the 20th century to build steamboat landings, allowing for easy transportation between Stockton, Sacramento, and the fields where they worked. California’s landscapes have been indelibly transformed by human society. Nowhere is this truer than in the snaking waterways of the California Delta, where in the late 19th century a concerted effort by Bay Area investors and local immigrant settlers converted the land from a great riverine marsh of tule grass, riparian forest, and wildflower beds into an industrial agricultural factory, capable of feeding the world. The remains of a kitchen from the 1911 cabin. 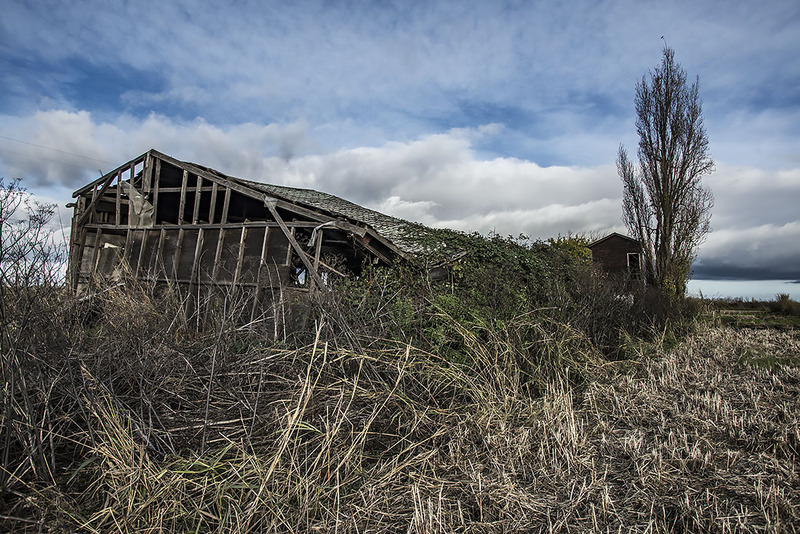 The residential spaces inhabited by farm laborers are often the least historically valued. 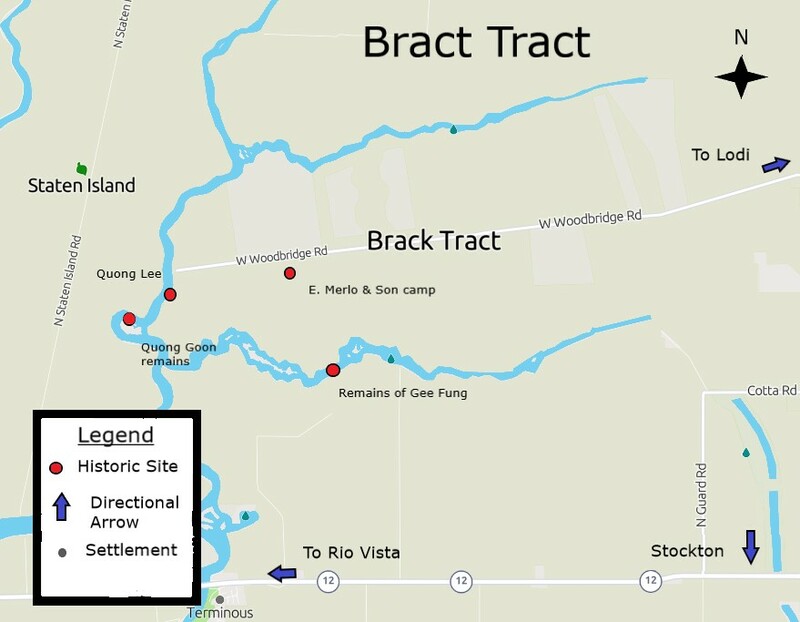 The origins of industrial development on Bract Tract can be traced to 1852, when German immigrant Jacob Brack purchased $10,000 of land from the Fisher Estate along the Mokelumne River, west of the town of Woodbridge. Over a period of 30 years Brack developed a diverse array of enterprises through his property: real estate sales, rental development, cattle ranching, grain agriculture, viticulture, and later brewing. To support his entrepreneurial bent, Brack vigorously altered the land. Hog Slough, due West of Woodbridge, was dredged first. Docks and warehouses sprung up on the banks of Mokelumne near its intersection with the slough, creating the nucleus of a small town, known as Brack’s Landing. Through partnership with other regional businessmen Brack was even able to bring a rail line to the town: a narrow-gauge named the San Joaquin and Sierra Nevada. In ’85 Brack purchased a dredger, hired a team of Chinese laborers from Stockton, and dredged Otter Slough, immediately South of the town. With this work, the outlines of modern day Brack Track took shape. Time and elements take their tolls on the 1911 cabin on Brack Tract. Into the turn of the century, Brack continued to develop his land. In 1888 he purchased a larger dredger, and after it burned down in 1890 he purchased another. By 1891, he had drained the entirety of his holdings between Hog and Otter slough, along Woodbridge Road. In newspapers and in legal documents, the land would from this point on be referred to as Brack Tract. He continued efforts to develop Brack’s Landing into a commercial center, but by the early twentieth century the town was largely abandoned. In 1899 a massive flood of the Mokelumne destroyed the town, and in 1903 a second flood led Brack to sell his holdings to his son and close friends, the Frankenheimers. Brack retired a wealthy man, and the Frankenheimers went on to rebuild the levies and have Brack Tract officially listed as a reclamation district by 1917. During the early decades of the twentieth century, the presence of easily accessible labor, in the form of Chinese immigrant farmworkers, was instrumental in changing the nature of agriculture in the Delta. The earliest reports of Brack’s reclamation projects refer to teams of Chinese laborers hired to work the dredger and wheelbarrow soil onto the tract. This was dangerous work. During these projects, multiple floods hit the Delta, and while no casualty statistics are available in the historical records, it’s not implausible to conclude that the Chinese community suffered from these events. In addition to floods, laborers worked through swarms of mosquitoes, and historical ecology studies of the area report a high incidence of malaria throughout the Delta. For Chinese wheelbarrow brigades in the Delta, the pay was minimal and the risks were great. Despite these risks, Chinese laborers and companies benefitted and indeed left their mark on the cultural landscape of Bract Tract. Between 1896 and 1900, 33 companies owned by Chinese proprietors and three Chinese individuals leased land for potato agriculture, effectively monopolizing the tract’s land. Another small company leased land on the Southwest of the tract between 1913 and 1917. Interviews with Susan and Robert Bishopburger, who grew up on Bract Tract, report of “bankrupt equipment,” or a pile of rusting and warped potato harvesting equipment left over from the last Chinese company to leave the area in 1917. The equipment, rusted, twisted, cracked, and intermingled with decades of younger refuse, can still be seen today. 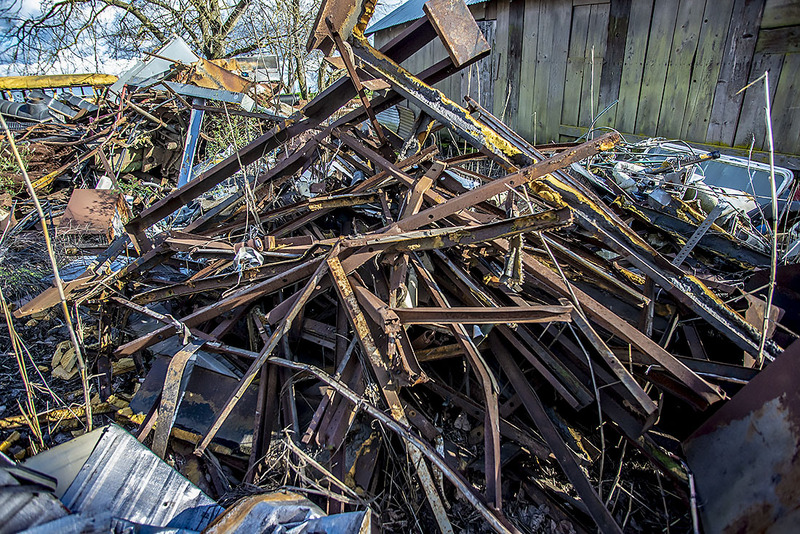 The Bankrupt Equipment.” This pile of rusted and warped metal began as the remains of abandoned potato harvesting equipment. The pile has continued to grow over the past 90 years. Chinese farmers and laborers also left their mark on the built environment of the Delta. An unassuming shack and water tower at the end of Woodbridge Road was built in 1910 and converted into a boarding house for Chinese laborers. In Sucheng Chan’s Bittersweet Harvest, a magisterial study of Chinese involvement in California agriculture, Chan presents a map titled “The Sacramento-San Joaquin Delta: Steamboat Landings Named after Chinese and Japanese, 1913.” The map uses data from a 1913 county map to clearly show four steamboat landings with Chinese names on Staten Island and Terminous Tract, across the water from Brack Tract. Chan postulates that the map may have contained inaccuracies, as the landings on the map exist on land that was never leased to Chinese tenants. The archaeological record on Brack Tract supports this hypothesis. Steamboat landings listed as Quong Lee and Quong Goon on Chan’s map lie directly opposite the remains of steamboat landings on the Westernmost edge of Bract Tract. One can still see the pilings rising out of the Mokelumne at low tide. Prior to levee maintenance in 2013, piles of rotting wooden rubble could be seen on the river’s banks. Similarly, the steamboat landing named Gee Fung, listed as having existed on Sycamore Slough (originally Otter Slough) lies directly opposite a peninsula on Brack Tract that contains mounds of rubble and extensive bittermelon patches. Eric Merlo, whose family purchased this area of Brack Tract in 1948, remembers his grandfather Emil and great-uncle Cesare discussing this camp as a child. The ability to hire large teams of Chinese workers allowed for farms to grow in size. Between 1891-1899, Brack leased small ranches of 90-115 acres a piece on Brack Tract to various farming concerns, for eight dollars an acre, plus varying percentages of crop yields. By 1920, the average lot on the tract was 500 acres, with all farms relying on a traveling seasonal workforce to function. To keep costs down and allow for profitable enterprise, farmers pitted ethnic groups against each other: Sikh, Japanese, Chinese, Mexican, and poor white contracting outfits were used across the Delta, and strikes and unions were actively put down through the leverage of the employer’s market: if one group demanded too high a wage, a farmer could simply call another contractor. Labor firms were segregated, helping to facilitate the system. Based off of the evidence available, it’s reasonable to conclude that agriculture in the Delta would not be industrial in scale if it were not for the availability of a low-cost labor force. Part 2: “Changing Demographics: Shifts to Filipino and Mexican Labor” coming soon. Lea, Ralph, and Christi Kennedy. “Pioneer Jacob Brack blazed the railroad line in early Lodi.” Lodi News-Sentinel, June 18, 2011. “Brack Tract Reclamation,” County of San Joaquin, 1917. Sacramento-San Joaquin Delta Historical Ecology Investigation: Exploring Pattern and Process. San Francisco Estuary Institute Aquatic Science Center. San Francisco, 2012. Bishopburger, Susan, and Bob Bishopburger. Interviewed by Phillip Merlo in San Joaquin County, January 23, 2019. Chan, Sucheng. This Bittersweet Soil. University of California Press. Berkeley, 1986. 171. Merlo, Eric. Interviewed by Phillip Merlo in Stockton, California, January 28, 2019. Phillip Merlo serves as the Director of Education at the San Joaquin County Historical Museum. He previously taught History at Franklin High School in Stockton. Phillip works with several local nonprofits, including Little Manila Rising, Restore the Delta, and the Friends of the Public Library. 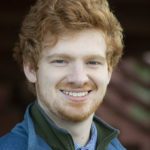 He strongly believes in using history and education to make the world a better place. Fascinating history, and evocative photos! Great piece, Phillip Merlo and Rich Turner! Thanks! I bird woodbridge road a lot and often wondered about that red building!! Now I know it was used by Chinese farm laborers! Thank you so much for the information and research!! 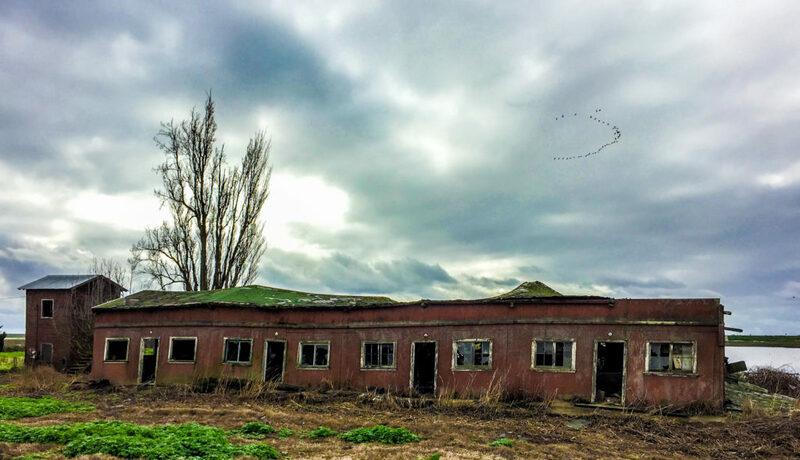 thanks i’ve wondered about that long low dormitory for 5 yrs now since i moved to lodi & began birding woodbridge rd. i’ve even watched the roof cave in since 2014-15; esp. after the big 2017 rains. Great article Phillip. I love reading about San Joaquin County History – especially gems like the one you’ve written. Looking forward to reading part 2.